A man got mugged. He was on his way to Jericho from Jerusalem. He was beaten, robbed, and left half dead. So begins Jesus’ story about the Good Samaritan. Alone and wounded, this victim was left by the road. A priest and a Levite passed the man at different times. Both of them crossed over the road, putting some distance between them and the one in need, and went on their ways. Neither, Jesus said, paused to even see if it was anyone he knew. Each refused to involve himself with the injustice done to a fellow traveler. Priests and Levites were men of the Temple. We read of their offices in the books of Moses. The instructions given in those chapters detail how these men were to assist people in trouble, primarily those who came to offer sacrifices for their sins. It was bloody work that they were assigned to do. Lambs and goats and pigeons and oxen had to be slain and butchered. Meat placed upon fiery altars. Blood splashed upon the brazen surfaces. Sin makes a mess of things, and the process of confession and offering magnified this to some extent. There are consequences to be recognized. Collateral damages do come as the result of our violations of God’s instructions. It began in the Garden. Adam fell and animals lost their lives. Blood was shed there among the trees. Skins were taken from beasts to provide covering for Adam and Eve’s nakedness. Leaves would not do. It was too easy to pluck foliage from the limbs and stitch them together. The Lord, at once, revealed the price that sin exacted in His Creation. Ignorance of His Word by human beings, the “very good” prizes of His work, the ones formed from dust by His hand, brought forth a crimson flow, the life of the flesh poured out upon the ground. Adam had to have seen it. He had to have felt it. Whatever species they were of, those beasts bore names that the man pronounced upon them. This scene served to bring home to Adam, who was made in the image of the Lord, the pain he had brought to the heart of God. The sacrifices and offerings represented object lessons drawn from what the Lord did in Eden. Abel followed this pattern and brought an acceptable offering in Genesis 4, his sacrifice came from his flock. Cain, however, presented another kind of offering, one that centered on his efforts and his production. God could not receive what Cain offered and Cain reacted in rage and slew Abel. Right offerings from contrite hands were what priests and Levites were supposed to be about. They were commissioned and outfitted to lead people in the Abel way of offering. Unfortunately, by the time Jesus showed up in Jerusalem, the priests there encouraged practices that fell in line with the Cain mode of sacrifice. Merchandizing and business practices had gained a hold in the Temple. And the priest and the Levite represent this trend of that day in the Luke 10 account. Jesus used these figures to show how performance-based religion can make people indifferent to real life lived with real people in accord with real love. A man bloodied by the sinful actions of others lay there. An opportunity for compassion presented itself. But with it was the risk of ritual uncleanness. This would cramp one’s religious style. Suppose the man was dead. Touch a dead body and the Temple would be off limits for several days. Rule mattered more to the priest and the Levite than the relationship. Jesus told this story in response to this question: “Who is my neighbor?” The question came from a lawyer, an expert in Moses’ Law, another Temple figure. His query came at the close of a debate with Jesus about eternal life and the greatest commandments, which the Lord reduced to these: Love God with all your heart, soul, mind, and strength; and love your neighbor as you love yourself. The lawyer, it seems, just wanted another rule to follow. “Define ‘neighbor’ so I can take the necessary steps to love him” was the thought behind his question. Jesus responded to the lawyer with the tale of the Samaritan. His choice of hero here was by design. Samaritans were viewed as outcasts by the Jews of the day – persons to be avoided, people seen as unclean. This is illustrated best in John 4, where the woman at the well marveled that Jesus would address her: “How is it that You, being a Jew, ask a drink from me, a Samaritan woman? For Jews have no dealings with Samaritans” (John 6:9). We know how the story goes. The Samaritan behaves in the neighborly way – he gets the man cleaned up, dresses his wounds, and gets him off the road and into an inn. The priest, the Levite, and this lawyer were more concerned with the “me” aspect. To look beyond themselves and relate to another, to reach toward one in desperate need was too much of a stretch for them. 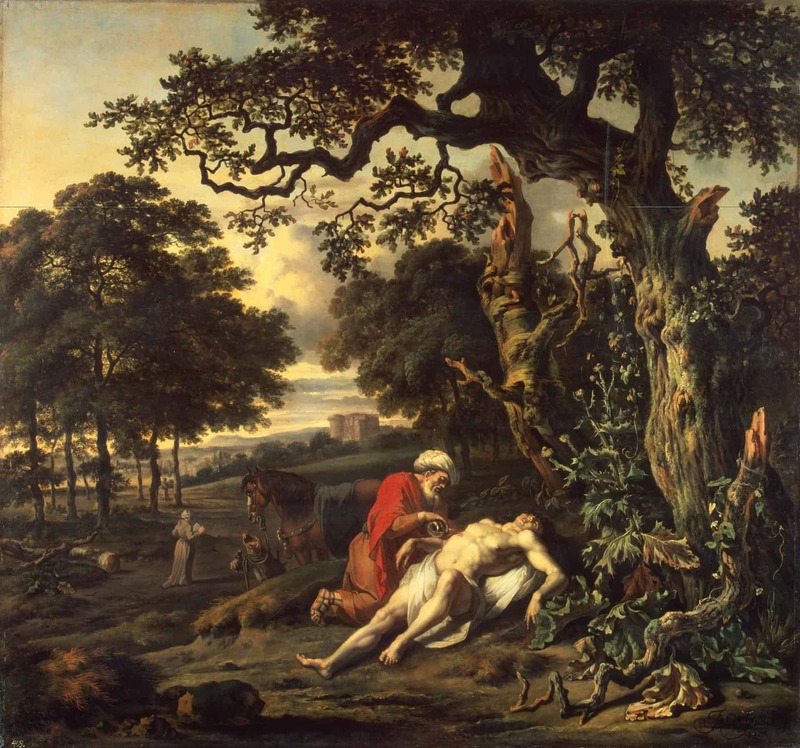 Why would the Samaritan respond with care and kindness? Perhaps, because he understood the feeling of being treated in an un-neighborly way. He saw the man in the ditch as someone like him. Jesus presented the Samaritan’s actions not as moves of condescension, but as something done in identification. This can be the effect of the grace life in our hearts. We, like the apostle Paul, must see ourselves as chief sinners walking among people roughed up and ripped off. We can recognize the lost as the losers we once were and, at times, still are. We have the words of eternal life, words that heal, words that cleanse. Oil and wine are with us. What we have makes faces to shine and gladdens hearts (see Psalm 104:15). And we bring them in from the streets. Our inns — our churches — have open doors. The weary find rest in them. The wounded are tended to and given space and time to heal. Our neighbors are us. Our neighbors need us, and we need our neighbors. For more on the story of the Good Samaritan, check out “Content of Character, Largeness of Heart,” a message preached by Thomas Schaller, Pastor of Greater Grace Church of Baltimore.